The Doctor and Peri take a holiday on the planet Gralista Social, but soon discover they aren’t the only time-travelling aliens in town. 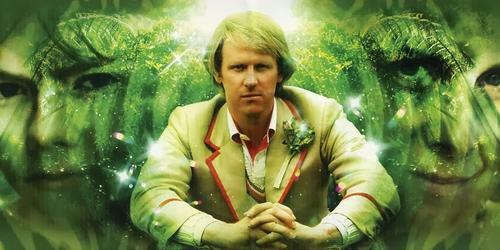 Peter Davison is the Doctor in Mission of the Viyrans. One of the goals of writing is to cause character growth and development, and one of the most common ways of doing so is by putting those the wringer, with emotional storylines that push a character to their utmost physical and emotional limits. While such events serve to grip the audience, there’s also only so much that an audience can take before a constant stream of tension and misery before they burn out, unable or unwilling to put up with the character’s constant struggle and hoping for a “win” of some sort. Breather episodes serve to give both the writers and the fans a bit of a break. Coming after, before, or even in the middle of intense story arcs, these stories tend to be a little more lighthearted, a little less serious, and not as connected to the preceding/following story lines. Throughout the history of Doctor Who, there have been examples of this concept in action: Black Orchid, a two-part historical, immediately preceding the horrific events of Earthshock, while The Empty Child/The Doctor Dances and Bad Wolf/The Parting of the Ways were separated by Boom Town which focused on Rose/Mickie and the Doctor’s dealings with a hostile alien, which included taking her out to dinner at one point. The Mind’s Eye comes off as a breather episode. Set between two emotional stories, it isn’t a lighthearted story by any means. Instead, it serves to tread some very familiar ground, going through the motions with a scenario that’s been played out time and time against through the history of fiction. It’s not a bad story by any means, it’s a story that just comes off as…there. It’s the one-part story that comes along with this serial, Mission of the Viyrans, that grabs the listener’s attention with a unique premise and some very nasty concepts and sound effects. Colin Brake’s previous audio, Three’s a Crowd, utilized some unique settings and concepts but ultimately was a story that relied on standard cliches of the genre and cultivated very little in the way of urgency. The Mind’s Eye travels down the same route, touching upon the convention of “is this a dream, or is this reality” but failing to establish any sense of tension. One of the reasons The Mind’s Eye feels incredibly pedestrian could come from two recent episodes that dealt with the concept of dreams vs. reality, episodes that played with the concept much better than this audio – Amy’s Choice and Last Christmas. Even without those episodes as comparison, there’s just nothing special about this story that stands out. It’s obvious from the very beginning which scenes are reality and which scenes are taking place in the dreamscape, and as such the conflicts within the dreamscape (Erimem dealing with a rebellion and Peri struggling with her stepson) don’t carry any dramatic weight. It doesn’t help that the Doctor’s attempts to convince Erimem and Peri to wake up consist of a lot of “you know this isn’t real” dialogue that goes on for much too long, and that the scientist and soldier characters come off as nothing more then uninteresting cliches. The highest marks I can give the script come at the very end. This is a Fifth Doctor story, so it’s no surprise that the story ends on a incredibly down note, but it’s a very well done and well acted down note, but most importantly, it helps set up the events of the following story, The Bride of Peladon. The post-production stands out, as Steve Foxon technically had to create music and sound effects for three different stories. The planet of YT45 comes alive through the sounds of jungle life, complete with rustling leaves and screeching wildlife both in nature and in captivity, while both New Cairo and soap opera-esque London are easily and quickly constructed in the listener’s mind. The acting is from the main trio is solid enough to carry their parts of the story. Peri’s dreamscape finds her living with her new boyfriend and trying to be a decent stepmom to his son, but events occur that turn her life into a soap opera…no surprise that such melodrama would come from the imagination of an American teenager! Nicola Bryant does the soap opera portion very well, complete with the appropriate levels of overacting and line delivery, but she also deserves credit for her anguish as she tries to deny the Doctor’s claims that her “life” is a construct of her subconscious’ desire to replace the family she lost (a weird narrative choice, because this story takes place before The Reaping and her mom’s death, but I chalked it up to her biological father’s passing). Kudos for Bryant’s delivery at the end of the story that “a lot of people died today, including my son,” a line that might have sounded cheesy in anyone’s else voice. Caroline Morris’ Erimem gets to be an actual Queen for the first time since The Eye of the Scorpion, and her dreamscape shows her as a firm-but-fair ruler who would rather negotiate and avoid creating martyrs than ruthlessly crush her enemies. Listeners get hints of the type of Queen that Erimem would have been as Morris delivers a royal performance. Once she’s out of the dreamscape, Erimem becomes a damsel-in-distress for a scene before fading into the background for much of the fourth episode, save for a scene where she urges Ukarme to let Hayton into their safe room, because just because Hayton was a potential murderer, Ukarme shouldn’t become one too. Peter Davison channels every single aspect of the Fifth Doctor in his performance – curiosity at the purpose of the scientific expedition and worming his way into receiving the grand tour, dismay at Erimem and Peri’s state, anger at Hayton for his willingness to let Peri die for the sake of science for profit, and willing to risk his life to save Peri…as well as Ukarme, someone who he barely knows. The supporting characters are a mixed bag. The minor characters within the dreamscapes do very well in their assigned roles as walking cliches (handmaiden, rebel leader, cautious advisor, boyfriend, best friend, teenage stepson), but since the listener knows they’re characters who will cease to exist once Peri and Erimem wake up, there’s no reason to get invested in their lives. Outside the dreamscape, Major Takol (Rebecca Front), Commander Ukarme (voice actor Richard Liang), and lead scientist Hayton (Vengeance on Varos, the Torchwood episode Countrycide, and currently known as Ser Alliser Thorne on Game of Thrones) go through the motions with their performances. Hayton’s accent is the best thing about his role, Front doesn’t make much of an impression beyond “yep, she’s the commander,” and Liang is incredibly neutral and unemotional for an experienced voice actor whose character is on the side of the angels, but utilizes incredibly questionable methods. While nothing about The Mind’s Eye truly stands out, it’s the one-parter Mission of the Viyrans that will stick with the listener. After the events of The Bride of Peladon (spoiler alert – this one-parter spoils Erimem’s actions during this story), the Doctor and Peri are relaxing on the planet of Grallista Social, Doctor Who’s answer to the Catalina [BLEEP]ing Wine Mixer. When Peri confronts the Doctor outside the party, teasing him about being anti-social, she quickly becomes horrified as the Doctor’s entire body contorts and transforms into a perfect copy of herself! Mission of the Viyrans can be heard for free on Soundcloud (the link is posted up top) so I won’t go too far into detail. It’s a story I encourage people to listen to and I don’t want to risk spoilers. Nicola Bryant carries the story, playing a freaked out Peri who’s scared on two levels – remember how the people at the party were transforming in a Cronenberg-type fashion (complete with some incredibly spine-scratching sound effects and the creepy effect of repeating Peri’s last words as they transform) and a Peri who is trying to figure out just what is going on with the disembodied voices demanding she forget what’s going on. Said voices are those of the Viyrans, aliens from another galaxy who, after a millennium of war, have dedicated themselves to eradicating biological weapons across the universe. In this case, Peri has been infected, and the only way to eliminate her as Patient Zero is to force her to forget she was ever a carrier of the virus. It’s a very well-done story with some fine acting from Bryant, and helps set up the return of the Viyrans down the road in the Sixth Doctor stories Patient Zero and Blue Forgotten Planet. So while Mission of the Viyrans is well worth the download, I can’t recommend The Mind’s Eye unless it’s on sale or one is a completest. It serves as a breather between Son of the Dragon and The Bride of Peladon, but Erimem’s actions and feelings at the end of Dragon can also serve as a lead-in to Bride. 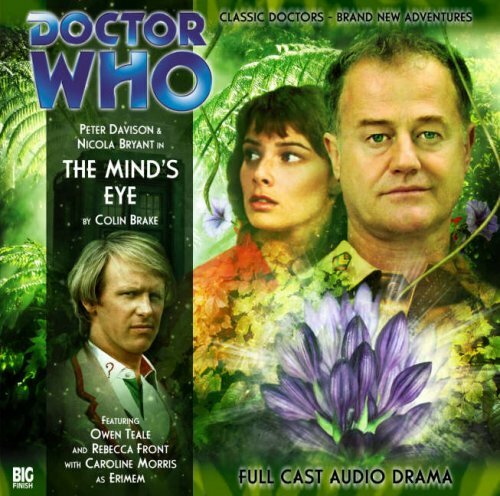 The Mind’s Eye really doesn’t do anything new with its central concept, and while the main cast carry their weight, the supporting cast just sleepwalks their way through the story, leaving this story nothing but faded fragments in the listener’s mind. Cobi’s Synopsis – The three-part story The Mind’s Eye can’t overcome an unambitious script and weak acting in the supporting roles, but the one-part Cronenberg-esque Mission of the Viyrans sees Nicola Bryant give an unforgettable performance. Next up – Set course for Singapore, 1931. Journey’s end. Paul McGann is the Doctor in…The Girl Who Never Was. This entry was posted in Big Finish Review and tagged Big Finish, Big Finish Audio, Big Finish Review, caroline morris, Doctor Who, Doctor Who Audio, Doctor Who Review, Erimem, Fifth Doctor, Nicola Bryant, Peri Brown, Peter Davison, TARDIS. Bookmark the permalink.